This large spacious home is located in Pisgah Forest (off of Kentwood Lane) and 15 minutes to downtown Brevard. It is also an hour from south-west of downtown Asheville, an hour to Asheville Regional airport. 45-minute drive to Greenville, South Carolina. Surround yourself with the beauty of nature while you vacation at Sweet Refrain, a mountain getaway nestled in Pisgah Forest. Sweet Refrain will have you falling in love with the Smokey Mountains and have you yearn to stay longer! Many guests return to this upscale newly remodeled home, year after year. This home has several levels. Starting on the first level, it features a living room and laundry room. Upstairs on the second level you will find a spacious and naturally lighted grand room, made of the living room and updated kitchen. The kitchen has all modern appliances with plenty of counter space that will bring out the chef in any person. Additionally, on this level there are two bedrooms accented with designer-colored walls and each have a queen size bed. 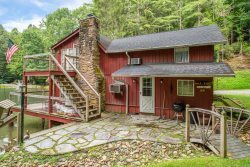 The best feature of this whole house are large windows on this level, that peer out into the Pisgah Forest. You will find your peace and tranquility just sitting on the couch in the living room looking out those windows. You can also get the same view from the open deck just a step outside the door. The third level features the Master Bedroom with a beautiful view of the grand room below.